Features colorful border and smooth writing space. Great for meetings, conferences, and other events. 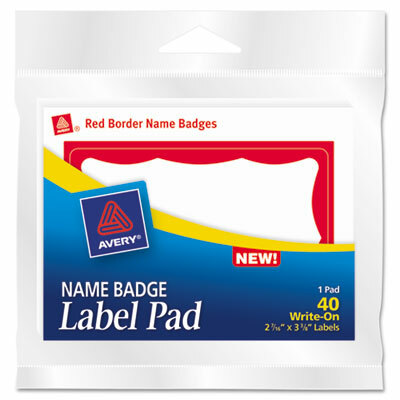 Large 3" x 4" label leaves plenty of writing space. Easy-to-use name badge label pads keep labels handy to use when you need them. Adhesive sticks firmly and removes smoothly. Large writing space and colorful border. Smooth surface makes bold writing stand out. Not recommended for use on delciate fabrics such as leather, suede and silk.